Heat the semolina in a little water to a thick consistency. Remove from the fire and keep it aside to cool. Make a batter with rice flour, coconut milk and water. 4. Add the cooked semolina, soaked yeast and sugar and then mix well. Keep the mixture to ferment for three to four hours. Heat the appam thava (the special vessel for making appam), rub a little oil and pour some batter into it. Turn the batter around in the thava and make it into a round with thin edges and a thick middle. Cover with a lid and keep it over a slow fire. 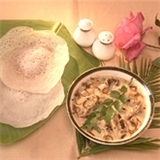 After the appam is ready, serve with mutton stew. Clean, cut and wash the mutton. Slice the onion, chillies and tomatoes. Peel and cut potatoes into four. Grind the coriander seeds and poppy seeds separately to a fine paste. Grind the ginger and garlic together. Add the onions, chillies,tomatoes, masala and salt to the mutton and mix well. Heat the ghee and add spices. Add the mutton and fry for a while. Add just sufficient water to cook the mutton; cook till it becomes soft and water is absorbed. Grate the coconut and take out 2 cups of milk. Add the milk and chopped coriander leaves. Simmer and remove from the fire and serve hot.